A pair of capsized jet skiers narrowly escaped being run over by a cruise ship in Florida last weekend when a quick thinking rescuer pulled them from the water mere seconds before they would have collided. 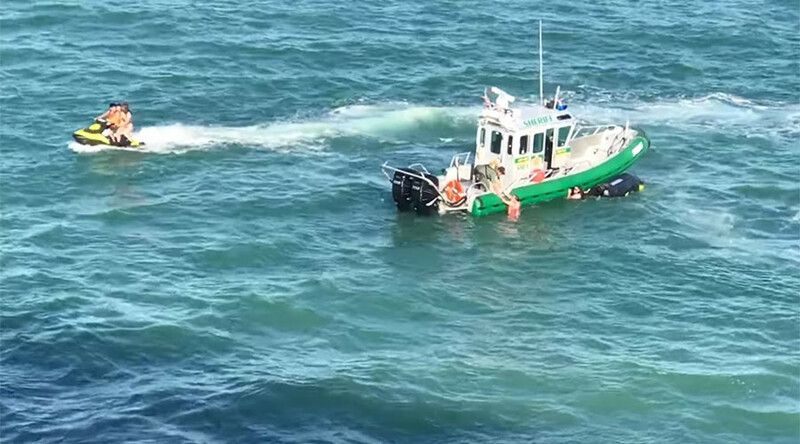 A video of the close encounter, which was taken by a passenger on the ship and uploaded to YouTube, shows the two jet skiers being pulled aboard a rescue ship at Port Canaveral, Florida. Thanks to the quick thinking of the cruise ship’s captain, Doug Brown, and a marine unit deputy, Taner Primmer, the unnamed jet skiers escaped unscathed. Brown spotted the pair in the water as he was navigating his cruise ship Carnival Magic out of the port, according to a post on Canaveral Pilots website. The Canaveral Pilots Association also posted a number of photos on their Facebook page.